We (innkeepers Mike and Cathy Dillon) went through the Summer Miracles program of an organization called Kidsave International, as we almost accidentally adopted two Russian children in the summer of 2002. It has been one of the most fabulous experiences of our lives! The following is the text of a speech Cathy made in Austin in late 2003...with a few updates along the way. If you are contemplating a similar older-child international adoption, please write us because we've got a lot of "done that been there" advice to pass along! I am a huge believer in Kidsave, and tonight I'm here to tell you why. Kidsave is a non-profit organization dedicated to getting children across the world out of institutions and into loving homes. 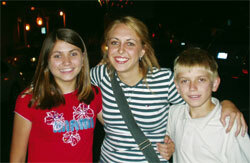 It began in 1999, working mostly with children in Eastern Europe. Its flagship program is called Summer Miracles, and it raises funds to send older orphans (ages 5 - 14) to the U.S. to spend a summer with various host families. Nationwide, it is organized into some 25-30 city-based volunteer chapters, including Austin and Houston. While here, the kids attend local day camps and participate in many fun and cultural activities with each other and their summer families, which allows everyone to get to know each other in a homelike environment. The goal is to find each child an permanent adoptive family while they're here. Sometimes the coordinators have to do a bit of juggling to find the right child/family fit, but we're proud to say that so far, some 96% of the summer kids have now returned to live in America. Austin's first year was in 2000, when 12 kids came to Austin and all were adopted. Similar numbers have come each year since then, and with only a rare exception or two, all those kids are now proud new Texans. And here are my three --Tatiana, Alexey, whom we adopted just last July, and our older daughter Sarah who we adopted at birth on Valentine's Day 19 years ago. So why, with our only child grown enough to head off for college, would we have ever wanted to bring on two more? Well, the answer is that they fell in our laps and we just couldn't resist! When Sarah was growing up, we always wanted more kids, but to be honest, we were just too darned busy working and raising her to put the work into finding them! Also to be honest, her birth story is so awe-inspiring that deep in my heart I felt like no child could ever measure up to it, or to her or our love for her, so for over 15 years we just didn't do anything. When it began to sink in that she would soon be leaving home, though, that began to change. We just weren't ready for "family life" to be over yet! We hadn't had our fill! But then what, since there was no way to contemplate adopting an infant, and adopting an older child seemed impossibly stupid and dangerous....? Well, I'm here to tell you that for people in just such a position in life, God created Kidsave. Second, because Kidsave is all about adopting older children who are probably not saddled with the same horrible abuse and neglect baggage as those available in the states. Kids in public care in Russia are almost universally there because of economics. The country is so Third World...so poverty-stricken. If one or both parents die, which is what happened to our kids (they had only been in the orphanage 6 months when Summer Miracles picked them for the 2001 program) other relatives can rarely afford to take them, so they enter a "Dietsky Dom". Now, while in the "Dom" they are for the most part adequately cared for, with serious supervision and education (shheeesh! they go to school 6 days a week), if only marginal nutrition, clothing, and love. They all seem to have a fairly great amount of fun with each other. But at 15, they "graduate" out onto the streets, and this is where the economic realities of Russia today come crashing in again, because there is NOTHING for them out there! And this is where it gets really ugly. One in three orphanage graduates become homeless; one in five winds up in jail; and one in 10 commits suicide. The girls often stay on the streets (HIV is rampant) and the boys are usually drafted into the army and sent off to Chechnya or wherever. It is just so sad to think of all that wasted potential. Third and and here's the real clencher, you get to LIVE WITH a child before you take on the permanent committment to bring him or her into your family! Think of it, ya'll......where else in all the world of child-rearing is this luxury available to you? If you adopt an infant, if you adopt through regular agency channels, even if you give birth naturally, you basically have no say in the selection process....someone else actually picks the child and earmarks it as yours, and then THAT's IT! You're stuck! For life! With this system, however, you know them well before you're ever asked to commit; yet the child's feelings are protected because they just think they're here for a fun summer vacation. So if an adoption never occurs, they return home without ever knowing the difference. So let me tell you about how our kids came to be ours. Actually, we were the third family to host them. There was some kind of friction at their first hosts' home; and the second hosts loved them but couldn't adopt anybody. They came to us with less than a week left to go before the Kidsave flight returned them to Russia and the almost certain fate that I described earlier. I first found Kidsave on the web late one night in March 2001. What struck me was the short-term, open-ended nature of it all--and hosting a child for a short time, I thought, we could easily do despite our advancing age :). So I responded, and then completely forgot about it, until months later I was standing beside a lake in Yellowstone during our summer vacation, and Mike's cell phone rang. It was that year's Austin coordinator, saying that she'd had a couple of host families back out and could we possibly take a child for the month? In principle, yes, I said; but we were thousands of miles and two weeks away from home...what to do? No problem, she said, just come up to Austin for one of the weekly get-togethers when you get home, and see if you might be interested in getting to know any of the available kids. So I did, and met these two, and when they arrived for a five-day visit, it was the highlight of our summer. Fiesta Texas, Schilitterbahn, tubing, new friends, they helped us at our bed and breakfast inn (now that they can talk, it turns out their mother was a caterer in Russia, so they were right at home in the kitchen! ), catching bugs which Russia has very few of....great fun! They didn't know a word of English then, but it was obvious they were very smart, energetic and interested in everything, and sweet, helpful, and well-mannered besides. They didn't smile much (we've since discovered that's a Russian thing; it is such a somber society compared to ours), and several times in those few days I heard them crying when they were alone. Since their parents had only recently died, we knew there would be some emotional rough spots, and their sadness just tugged at your heart. kids at the Klimatino orphanage, winter 2001. Note all those straight faces. It took months for ours to begin smiling easily and naturally. But we loved having them around. We couldn't drag them out of the water each day.....we loved hearing them chatter (and sometimes holler) at one another in Russian......they ate everything I cooked which was an amazing experience after having just raised a picky teenager...even the language barrier was and is a great learning experience. The breakthrough came one day during lunch....."what kind of sandwich do you want--ham (oink oink), beef (moo moo) or chicken (cluck cluck, flap arms, chicken dancing around the kitchen!) By the time we took them to the airport, Mike and I had decided that if we got the chance, we would invite them to come back and live with us. Luckily, there was a Kidsave interpreter at the airport, so heart in throat, I told them what we were thinking, half expecting them to say Thanks Anyway.....but the miracle was that they had been wanting us to ask! So here came these huge excited smiles, the first ever, and Tatiana threw her arms around me. So our last vision of them was as they walked to the plane, clutching new dolls and toys, tears in everybody's eyes. That was Aug 21 of 2001. It was October before we knew that they were even legally free for adoption, and then the end of May before all the paperwork came together. Because we were just chance participants coming in at the tail end of the first summer's visit, we had done nothing in advance....whereas lots of families already had everything ready to go.....their home studies, INS clearances, police investigations, and so on. And doing all that takes time. By March I was spitting nails--it seemed like there was no end to the problems that kept appearing. By April, when all the other kids were already back here, I was ready to give up. For one thing, the chorus of naysayers was loud; so many people including family told us we were crazy and facing untold troubles from this insane thing we were doing. One long-time close friend even told us in disgust to cross her off our social list if we actually brought young children back into our lives. My doubts grew stronger the longer it dragged on, but it was as if this higher power was directing us "you WILL do this" and we said "yes sir" without really knowing why. But in May we got our formal "invitation" to travel over for the first trip, and we finally departed the second week in June. The purpose of the first trip was to launch the court proceedings in the region where they lived, which is on the Volga River north of Moscow. Russia is more beautiful than we ever expected: magnificent historical architecture, green rolling hills, crisp air, wildflowers, pretty little cottages, churches on every square block.....but scruffy around the edges.....sort of a cross between Mexico and Colorado. Plus, if you can possibly go in June, do, and go to St. Petersburg as well as Moscow, because it's so far north that the nights are silvery and magical. Sunset was at 11 pm, dawn at 3:30. They call this season "white nights", and it's spectacular, everybody's out strolling at all hours. Their orphanage is in a village called Klimatino, on a hillside overlooking a broad valley; on the back of the hill is a little lake where all the kids swim every afternoon. My first sight of them all was as they came running up the hill through the wildflowers toward us, excited and chattering and dripping wet....with the big blue sky and white puffy clouds and mountains in the background, it felt like something out of the Sound of Music. These turned out to be tree-climbing game-playing healthy country kids, not the faceless gray apartment dwellers I'd been picturing. Honestly ya'll, they were enchanting. I could have scooped up any one of them and brought them home. But Alexey and Tatiana were just as great as we remembered, and so excited about their upcoming new life. The next time we saw the whole troupe, when we returned for our final court hearing in July, it was a far gloomier occasion, because everyone in the orphanage turned out to see Tatiana and Alexey off, including neighbors and caregivers and relatives including their older brother who had agreed to let them go, but was clearly having a very hard time with it. Everyone cried, including us. And to our surprise because nobody warned us to expect this, they left with just the clothes on their back, because the orphanage kept everything for the remaining children. Our first night in a hotel, we had to go get them underwear and toothbrushes. Then the next day it was time to shop for shoes because theirs were several sizes too small. After two days in Yaroslavl doing legal things, we returned to Moscow for a week where we dealt with the embassy and immigration issues. It's an awesome, cosmopolitan city and we saw every corner of it--the Bolshoi ballet, the Kremlin and Red Square, the Czar's diamonds, the Moscow Circus, the Zoo, Gorky Park, and a lot more. One of the best treats was an incredible huge toy store called Dietsky Mir, which was worth it even if you discount how happy it made our new children. All they each really wanted was a stuffed animal, and the place has millions. If you go to Russia, don't short yourself on tourist time, and do take the opportunity to stay in private apartments if that is offered to you. We felt like that extra week gave us an appreciation for the children's culture and language. By the way, we had taken with us an electronic Russian-English translator, so we spent lots of time typing on it as we all tried to communicate with one another. Another aside is that we took Sarah with us, and were so glad we did, as it meant the earth for the kids to have an older sibling to relate to. She had an amazing ability to speak "kid" with them, so she could get the message through when Mike and I couldn't. It bonded our new family in such a positive way, plus she was fabulous help with the trip's complicated logistics. We got back to the states on August 1, and they started school two weeks later. He picked a public elementary and is in fourth grade, she picked a small private Christian school and is in 7th. There were such fun things over the early few months as they settled into this alien world....like the time Alex brushed his teeth with a tube of Icy Hot because he couldn't read the tube....... (incidentally, in case you're wondering, the language barrier has been a non-issue, more fun than hassle. There are so many people around who speak Russian, but after three months we rarely needed interpreters any more).....and the first time they went to church, Sarah took them up in the balcony while Mike and I sat below, because we wanted them to get up and move around if they needed to. All was well until halfway through the sermon he started yelling "Mom! Mom!" and waving wildly when he spied us from the balcony.....and the icebreaker that turned Tatiana's first day of school from terrifying to triumphant when the class asked her to teach them some Russian words and it turned out the word for brother--no kidding-- is Brat! Happily, in both schools, the other students have reached out to these two in the most amazing way. I wouldn't have expected it, but they are little mini-celebrities and I think it's because so few of us Americans have ever met a Russian, let alone had the chance to help or nurture one. Whatever the explanation, they both have lots of friends and have just embraced life in a way I could have only prayed for. It's so much fun to teach them, and learn from them, and to see the simplest things through their fresh young eyes. Try explaining from the ground up, things like the Statue of Liberty, Pearl Harbor, the Civil Rights movement, and "Houston, we've got a problem". Cell phones and freeways and movie theaters and football games and a herd of deer on your lawn.....are all so incredible, if you take the time to think about it. It's fun to be back again into those early years so full of promise and homework and sleepovers and birthday parties and bedtime reading and Santa Claus, and all those things I thought I'd have to wait for grandchildren to get to experience again. I wake up every morning just saying Thank You Lord for enriching my life in this way. A year ago all the naysayers were saying this ridiculous unnecessary adventure was going to put us both in early graves......and now those same people are saying that we both look 10 years younger! But I know it's true that these kids have given us new energy and a fun new focus for our lives. "Or go fishin'"? he grinned (and batted his beautiful gray eyes at me--every time he does that, I just melt) And then it hit me that you know what? YOUNG people DO things. OLDER people USED TO DO things, and besides that they work too much. So I don't know if it's making us any younger, but it is true that these days Mike and I opt for fun stuff instead of work whenever we can ...and so, last Saturday, we went fishin. Guys, somewhere on the other side of the world are thousands more Alexey and Tatianas, full of potential but facing a future dreary enough that people around them rarely smile and so they don't either. But that's what Kidsave is all about, so you can help, starting tonight. Do you remember that old story about the little boy on the beach, standing in the middle of a million beached starfish, throwing them one by one back into the ocean? An old man stopped and said "boy, why bother? You'll never make a difference--you can't save them all." And the little boy replied, "but it will make a difference to THIS one", and kept on throwing. Well, if Kidsave is like that little boy, our financial support (and our love and prayers) are like his throwing arm. Summer is coming and if we can raise enough money tonight, we can get at least a few great kids out of oblivion.....onto that plane.....and over here to a world they can't even conceive of right now. Somehow, someway, we have to succeed, because they each have a date with their very own......summer miracle. Winter 2006--Mike, Cathy, and Sarah with two remarkably polite, civilized, and smiling all-American kids attending their first grownup formal event. And then guess what? October 2013, a friend's wedding...... the maid of honor and her "brat" brother, with their significant others. All's right with the world. Over and out. © Crystal River Inn, 2018. All Rights Reserved. Design by The Quotable Quill.